There will be more in store from “Silver Screen Reflections,” right after the end of the semester (and after the end of stressful finals) at Hood College. A re-post from my other classic film & multimedia blog, “At The Matinee.” Newer posts will appear shortly after the end of the semester at Hood College. For now, enjoy this classic post! Before “The History Channel” turned into another reality show channel, the network showcased vintage newsreel-style short subjects that were reformatted for exhibition in classrooms. Several years ago, The Internet Archive, in conjunction with the Bishop Dwenger High School Library has uploaded select issues of the vintage Hearst Metrotone “Screen News Digest” series. The series premiered in 1958, and it was possibly created as a response to Warner Bros.’ “News Magazine of the Screen.” Warners’ version, which was a brief anthology of the studio’s then-current newsreel shorts (from Warners’ Pathé News unit, which was acquired by the studio in 1948- and was discontinued due to competition from television in 1956). According to Geoff Alexander’s 2010 book, “Academic Films for the Classroom: A History.” Hearst’s classroom newsreel series was created by Jerome Foreman (who left Hearst’s newsreel division in 1960 to form Allegro Productions, a company that is known for producing the “Science Screen Report”). Many topics were presented throughout the series’ run, consisting of current events or historical subjects. 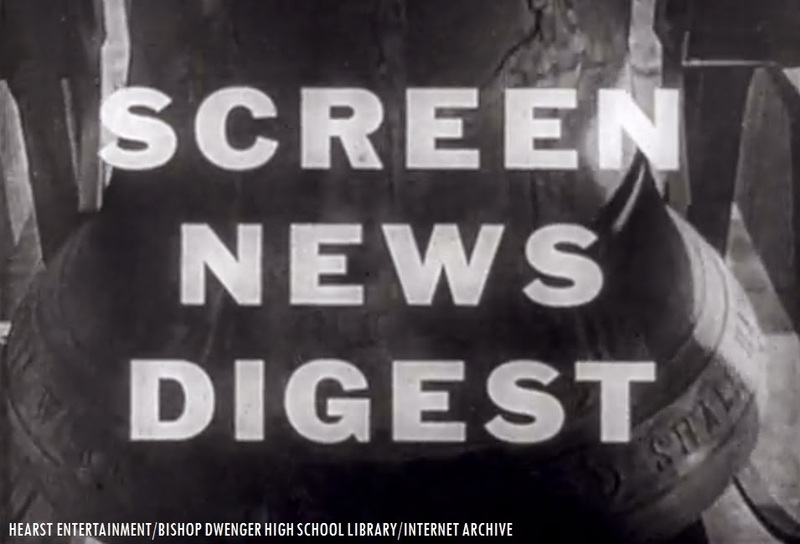 After Hearst discontinued their newsreel unit in 1967 (the same year that rival Universal Studios discontinued their long-running newsreel series), the producers of Screen News Digest relied on past stock footage from the Hearst Metrotone/News of the Day/Telenews library, in addition to new footage filmed by Hearst’s television news bureaus. The series migrated to color footage in the late 1960’s, and ran until Hearst discontinued the series in the early 1980’s- as videocassette recorders would replace 16mm film projectors in schools across the country. Since 2014, the Internet Archive has uploaded 62 select versions of the Hearst “Screen News Digest” series. Perfect for archivists, fans of vintage/cult film and people who would like to learn more about newsreels. A perfect compliment to the Prelinger Archives collection. 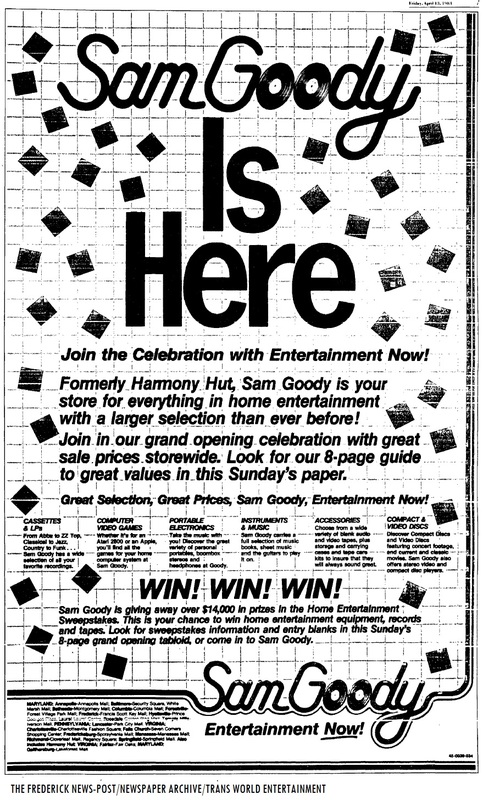 1984 ad for the now-defunct Sam Goody chain, as featured in The News-Post. 22 years after the airing of his documentary titled “Baseball,” a new film on one of the legends of the game will air on Public Television. Documentarian Ken Burns’ two-part film on the life, legend and legacy of Jackie Robinson (1919-1972) will air on PBS this evening (the second part will air on Tuesday). Filmed by Burns, along with daughter Sarah Burns and son-in-law David McMahon, this new documentary on Robinson will focus on his career in the major leagues, breaking the color barrier in the game and his early involvement in addressing civil rights. Burns’ documentary will feature interviews with Robinson’s wife, Rachel Robinson, along with President Barack Obama and First Lady Michelle Obama, Harry Belafonte, Tom Brokaw, Carly Simon, former baseball players Ralph Branca, Carl Erskine and Don Newcombe. Actor Jamie Foxx provides the voice of Jackie Robinson, reading excerpts from personal letters, newspaper articles and autobiographical works. A must-see for those who may want to learn more about Robinson, including fans of baseball and documentary filmmaking. In the Washington, D.C./Frederick area: WETA (26.1/Comcast 26), Maryland Public Television (WFPT-62.1/Comcast 22). Burns’ two-part documentary will be available on PBS’ website (and Roku platform) after the airdate. A condensed re-post from my other blog, “At The Matinee” (and in honor of Record Store Day, which takes place on April 16, 2016). Be on the lookout for another vintage short film (in relation to records and sound recording) next week on this site. Waxie Maxie’s. Wall-To-Wall Audio & Video/The Wall. Sam Goody. Harmony Hut. Camelot Music. Waves Music. Tower Records. This 1971 film of the day-to-day operations of the Los Angeles Tower Records location on Sunset Boulevard. This is one of many experimental short films on the Internet Archive (via the Center for Sacramento History). It was filmed and edited by Sacramento City College professor Darrell Forney. Forney mixed his footage with two popular hit songs (of the era)- “Thank You For Letting Me Be Myself Again” by Sly & The Family Stone, and “Me and Bobby McGee” by Janis Joplin. Tower would enter the Washington area in the mid-1980’s. The Sacramento-based chain shuttered all of its stores in 2006 due to various factors, including financial problems, online retailers and the rise of digital downloads. Forney’s film is an interesting look at the then-modern record store of the day, and one of the popular locations of the Tower chain. It is a must see for lovers of music on all formats! If you enjoyed Darrell Forney’s film of Tower Records in 1971, be sure to support your local record store on April 16. And when you do purchase your favorite music on vinyl or CD, be sure to play your favorite songs on a good, well-calibrated stereo system! In honor of April Fools’ Day, “Silver Screen Reflections” looks back at this vintage classic comedy moment in cinema from 1933. Here is the iconic Lemonade Vendor scene from the classic Marx Brothers comedy “Duck Soup,” featuring Chico Marx, Harpo Marx and the “master of the slow burn,” Edgar Kennedy. Enjoy (and happy April Fools’ to all)!